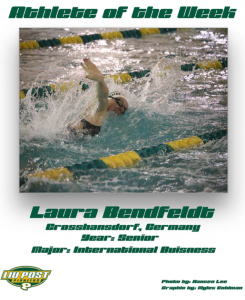 Women’s swim team member Laura Bendfeldt, a senior international business major, is a two time All-American and four time scholar All-American, who is ranked 11th in the 100 backstroke prior to the Division 2 NCAA Championships in March 2018 in North Carolina. It will be the fourth year Bendfeldt will attend the event. Bendfeldt accumulated her seventh, eighth and ninth wins of 2018 in a tri-meet against Kutztown and Millersville on Jan. 27. That meet also saw her undefeated during the dual meet season in the 50 yard freestyle. Along with being an outstanding athlete, Bendfeldt also swims past the competition in the classroom. Reaching the end of her bachelor’s degree in international business, Bendfeldt holds a cumulative GPA of 3.97. “Swimming is basically a full time job; you have to have enough rest, food, time to stretch; it’s more than the 20 hours in the pool,” she said. “Sometimes the academic community is less understanding of that; that’s when you have to rely on your coach to help you out.” Head swim coach Kristen Foley commends Bendfeldt for her work ethic both in and out of the pool. 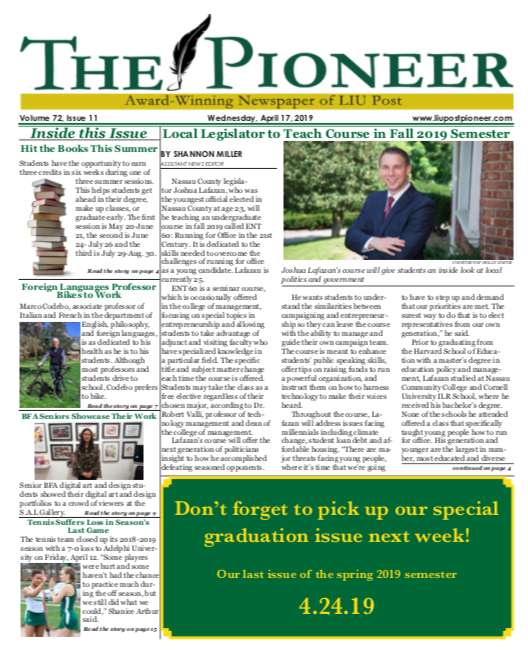 Bendfeldt spoke humbly of her successes during the four years she has been on the swim team at Post. “You can’t achieve anything without a team behind you, supporting you,” she said. “Everything I have achieved so far has to be due to my teammates and friends, and for that I will always be grateful to them,” she added.